Undecided voters appear to be moving to the NDP camp. 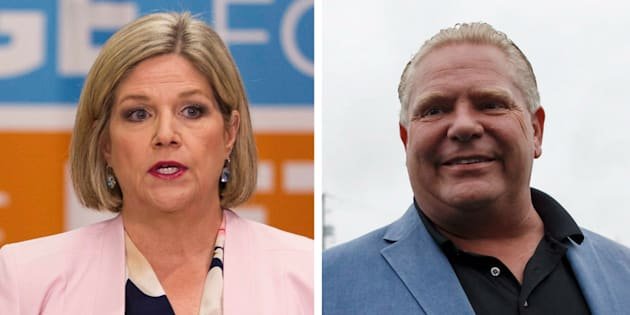 Abacus Data says its surveys show Doug Ford is most likely to become Ontario's next premier, although Andrea Horwath could potentially pull off an upset win. With two weeks to go before the Ontario election, a new poll puts the NDP neck-and-neck with the Progressive Conservatives, and suggests that Kathleen Wynne's Liberals have little chance at forming government again. Thirty-five per cent of decided voters told Abacus Data they'd support Doug Ford's PCs, while 34 per cent said they would vote NDP, and 24 per cent said they'd cast a ballot for the Liberals. Ontario NDP Leader Andrea Horwath waves to supporters at an NDP rally in Brampton, Ont. on May 21, 2018. Support for Andrea Horwath's NDP rose by five percentage points in the last two weeks, according to Abacus. In the same timeframe, the Liberals saw support drop by five points and while it held steady for the PCs. "The Tories are holding onto much of their support, the NDP is converting undecideds and attracting some Liberals, while the Liberals are leaking support to the NDP and undecided category," Abacus Data's David Coletto wrote in a blog post. Ford is still the favourite to become Ontario's next premier, Coletto wrote, although it's "absolutely" possible that the NDP will pull off an upset. Left-wing voters are divided between the Liberals and the NDP, while right-wing voters are united in support for the PCs. However, Horwath has seen support for her party rise by a total of 10 percentage points since April, Abacus Data shows. "There are still two weeks left in this campaign and two thirds of the electorate is open to voting NDP," Coletto writes. In a contentious election, the Abacus poll suggests an NDP win would be the least divisive. More than 50 per cent said they are "dismayed" at the prospect of a Wynne government, compared to 41 per cent who said so about a one led by Ford and just 19 per cent about Horwath in power. The Abacus survey was conducted online with 2,824 Ontarians over the age of 18. The margin of error for a comparable probability-based random sample of the same size is +/- 1.9 per cent, 19 times out of 20. The data was weighted according to census data to ensure that the sample matched Ontario's population according to age, gender, educational attainment, and region, said the company.